Cynthia Watros will replace Michelle Stafford to play Nina (no word on when yet). Don't miss the Daytime Emmys, streaming online Sunday, May 5, at 8 p.m. ET. Everything you need to know about this year's Daytime Emmys! Full nominations announced Wednesday, March 20 on "The Talk!" GHFCW 2019 - Let me start this off with a clarification of rumors and just let you guys know where I stand with all this. Every year the rumors start that this is our last fan club weekend. Well, I am going to tell you just like I told the crowd last year at FCW. This year we are celebrating 44 years of GHFCW. We are the originals, we started this trend. Now it has become all about something else. You will have to read between the lines. That is just putting it plain and simple, and that is all I am going to say about that. We have people confusing us now with the GH Convention which they moved to June. That cannot help us. One thing I always preach is, that is a Convention and we are a small intimate group. I hope you guys know the difference without me spelling that out. There is a group that now takes the actors except for the janitor all over the country, so that means you do not have to travel out to LA anymore. Not only that they now use our slogan we are GHFCW they are using GHFW which is very confusing to the fans. Our events are in no way the same. So bottom line is I am taking this one year at time now. Is this our last year? It could be. I hope not but it could be. When we no longer sell enough tickets to pay the cost of the events then yes, we will have to shut it down. So that is up to the fans if we stay or if we go. I understand you have many choices, no longer are we the only game in town. But I hope that we have built a loyal following that hangs in with us, not going to lie. It is kind of like living in a small town and you have the only Dollar Store in town and then a Super Wal-Mart moves in. Where is the little man going to go? Probable out of business. ABC has deep pockets for their conventions, the other group well they have deep pockets also. Last year we gave over $10,000 to charity after our event. So, there is no money left. We start over each year so to speak. This year we will be raising money for a special charity and a cause close to our hearts. More about that later. We did this back in the day when we had Super Soap Weekend and it went just fine. It actually gives everyone a flavor they may like. I do and will always support anything ABC/GH does. Always! So, there you have it. You guys come, we stay, you guys stay away we go home. That is pretty simple I would say! Love to you all! So now that is out of the way, lets get on to more pleasant things like the GHFCW2019. July 25-29, 2016. Held in Glendale, CA at the Embassy Suites Hotel. Tickets are on sale for the Welcome Event (always a fan favorite) on Thursday, July 25th and for the Main Cast Event on Saturday, July 27th. You can get your order forms by going to our website ghfanclub.com to download. I will also attach you a copy here for easy access. We will have our full line up out shortly. It is going to be an incredible 5 day back to back event weekend. Bringing back the Karaoke, Bingo with Wally is back and just tons of other events. I hope you guys can try to make it. We love for you to join us. If you have never been given us a try. Hotel room block should go up shortly and that sells out quickly so keep your eyes open for the announcement. Happy 56th Anniversary to GH! On his podcast, Steve Burton (Jason) hosted a lunch with Bradford Anderson (Spinelli) and about 30 fans in a Glendale restaurant. Bradford said that they were at an "undisclosed location in Glendale, CA." Burton laughed and then made inappropriate remarks that many fans are calling racist. They are asking ABC to fire Burton for his remarks, the same way they did Roseanne Barr when she tweeted offensive remarks. So far, Burton has not apologized, nor addressed the issue at all, and neither has ABC or GH. The remarks were edited out of the podcast, but several fans, who were listening live, saved a copy of the remarks. Here is what Burton said: "And they're starting to serve the food... You're gonna hear some ghetto clanks, there's the chicken and the watermelon. I don't know what's going on here." Some fans thought he said "fried chicken," making it worse. SID Spoilers: What's Wrong with Dante? The pre-nominated performers were selected through an online judging ballot containing all the entrants. Judges were required to view clips of the performances before selecting their top 10 choices in each of the nine performer categories. The blue-ribbon screening round will begin on Thursday, Feb. 21, which will determine the final nominees in each category as well as the final recipient of the coveted Daytime Emmy Award. The final nominations will be announced on Wednesday, March 20. Outstanding Lead Actor - Maurice Benard (Sonny) and Jon Lindstrom (Ryan/Kevin). Also, former GH actors Stephen Nichols (ex-Stephan) and Jason Thompson (ex-Patrick ). Outstanding Supporting Actress - Tamara Braun (Kim), Kirsten Storms (Maxie) and Vernee Watson (Stella). Outstanding Supporting Actor - Max Gail (Mike), Wes Ramsey (Peter) and Dominic Zamprogna (Dante). Outstanding Younger Actress - Hayley Erin (Kiki), Chloe Lanier (Nelle) and Eden McCoy (Josslyn). Outstanding Younger Actor - William Lipton (Cameron) and Garrin Stitt (Oscar). James Patrick Stuart (Valentin) has new music that will be released soon. His new album, The Apple Tree, will be available for download on iTunes in April. Be sure to put that on your calendars! We are so happy to hear that Emme Rylan aka Lulu Falconeri has renewed her contract and will be hanging out in Port Charles a little longer. Always a fan favorite Emme started her run as Lulu In 2013 replacing the very popular Julie Berman. Emme hung in there and worked hard to make the character of Lulu her own. LULU STRONG, proud of ya Rylan! As happy as we are that Emme is staying the cast and crew were saddened by the retirement of longtime cameraman Dale Carson. He retired on January 31st after four decades with General Hospital. Dale was also a crew member of spinoffs PORT CHARLES & GENERAL HOSPITAL: NIGHT SHIFT. Brytni Sarpy (Valerie) has joined the cast of Y&R in the contract role of Elena Dawson. The actress will begin taping next week, and her character will cross paths with several key players in Genoa City. Sarpy first hit the daytime scene in 2015 as Valerie Spencer and has seen a recent uptick in Port Charles appearances. No word yet on what will happen to Valerie. Jaime Ray Newman (ex-Kristina) and her husband won an Oscar this week for Best Short Film for their film "Skin." To coincide with Maurice Benard's extraordinary 25 years on the show and a very special anniversary episode airing today, MONDAY, NOV. 12, “General Hospital” fans will be able to access 20 episodes featuring the best and most memorable moments from Sonny (Maurice Benard) and Carly's (Sarah Joy Brown, Tamara Braun and Laura Wright, appearing chronologically) explosive and tumultuous 20-year relationship. Beginning today through Feb. 12, all 20 episodes are available for viewers with no sign in required at abc.com/sonnyandcarly and on the ABC app. ABC.com and the ABC app enables users nationwide to access full episodes of their favorite current ABC shows, including “The Bachelorette,” “Grey's Anatomy,” “Marvel's Agents of S.H.I.E.L.D.,” “Modern Family” and “Shark Tank.” Viewers who sign in with a participating TV provider have the added benefit of being able to watch the most recent episodes the day after they air and a 24-hour live network stream in select markets. The ABC app is available in the App Store , ABC.com, Amazon Appstore , Google Play and on most connected TV devices. “General Hospital” celebrated its 55th anniversary on April 1, 2018. It is both the longest-running American soap opera currently in production and the longest-running scripted television drama currently in production. “General Hospital” has won the prestigious Emmy® Award for Outstanding Daytime Drama a record 13 times. “General Hospital” was created by Frank and Doris Hursley. Frank Valentini is the executive producer. “General Hospital” airs weekdays on The ABC Television Network. On August 7, 2017, Chris Van Etten joined Shelly Altman as GH's co-head writers. Steve Burton (ex-Dylan, Y&R; ex-Jason, GH) launched a guide for losing weight and becoming fit at www.burtonnutrition.com. The online program offers tips, recipes and products to purchase to help achieve a healthier lifestyle. There's also a VIP Club to join that offers more benefits, such as weekly webinars with Burton and other fitness celebrities. If you loved AMC and/or OLTL and would like to see them back, please show your support to ABC & Hulu. Right now, they are considering airing vintage episodes & incorporating some characters into GH. Click here to find out how you can help make that happen! Steve Burton (Dylan, Y&R; ex-Jason, GH) & Derk Cheetwood (Max, GH) have launched a new business called HollywoodSchooled.com where people can sign up for audio coaching lessons, learn how to avoid common mistakes, and become working and thriving actors in Hollywood. Set to the tune of "Mad Love" by JoJo, the sleek 30-second GH Winter Romance promo showcases Sonny & Carly (played by Maurice Benard & Laura Wright), as well as Elizabeth and Franco (Rebecca Herbst & Roger Howarth), with a forlorn Griffin (Matt Cohen) as odd man out. Also featured are Nelle/Michael (Chloe Lanier & Chad Duell), Jordan/Curtis/André (Vinessa Antoine, Donnell Turner, & Anthony Montgomery), Maxie/Nathan (Kirsten Storms & Ryan Paevey), and Kiki/Dillon (Hayley Erin & Robert Palmer Watkins). Enjoy the new GH Merry Christmas Happy Holidays Cast Video! 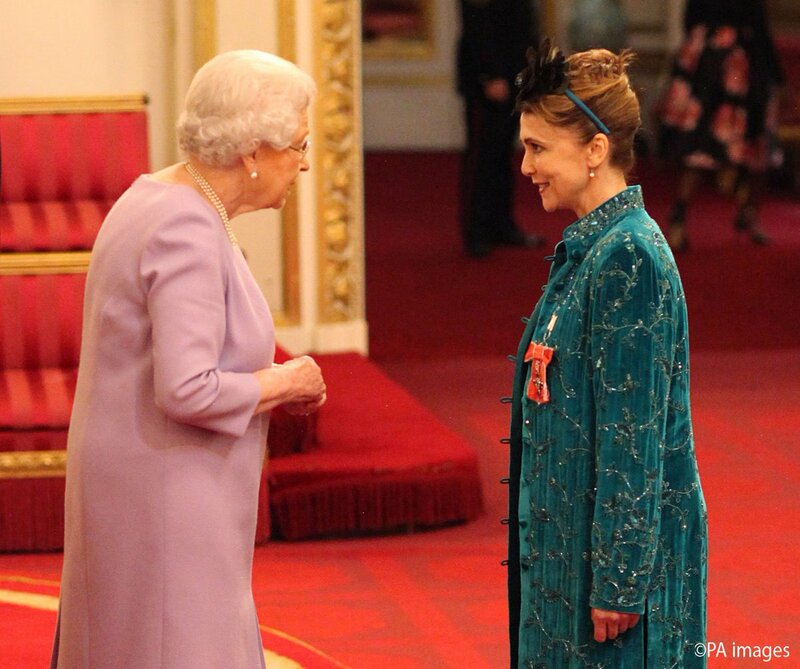 On October 25, 2016, Emma Samms (ex-Holly) was appointed MBE (Member of the Order of the British Empire) by Queen Elizabeth II at Buckingham Palace in London for her work with the Starlight Children's Foundation that she co-founded, bringing happiness to seriously ill children. Writer Claire Labine died on November 10, 2016 at 82 years of age. She created Ryan's Hope as well as many beautiful stories for GH, OLTL, & GL. Michelle Stafford (Nina, GH; ex-Phyllis, Y&R), hosts a podcast " Single Mom A Go-Go" on Monday, July 11 at 7 p.m. PT / 10 p.m. ET, featuring Lauralee Bell (Christine, Y&R). Siri Pinter is Mark Pinter's (ex-Agent Rayner) daughter by his first wife. She's married to NBC's Carson Daly and has a food blog at http://siriouslydelicious.blogspot.com. Robert Palmer Watkins (Dillon), with a little help from his friends, released a cover of Justin Bieber's "Love Yourself" on January 22, 2016. Watch an extended cut from ABC with never-before-seen footage of Robin and Patrick's wedding episode of January 7 with a special introduction by Finola Hughes (Anna). Steve Burton (Dylan, Y&R; ex-Jason, GH) & Jonathan Jackson (ex-Lucky) have teamed up to open a family-friendly restaurant called "Jack and Jameson's Smokehouse" with great barbecue and world-class music at 509 Hillsboro Road in Franklin, TN near Nashville. Enjoy a little tune with Maurice Benard (Sonny) and his teen daughter, Cassidy, who's a bit embarrassed. 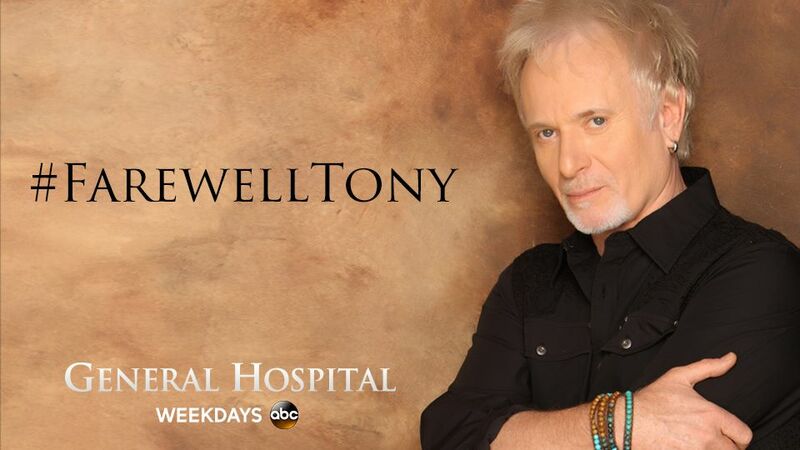 Watch Tony Geary on ABC's Nightline on 7/22/15! Great interview with Tony Geary about leaving the show! Michael Easton (Silas, GH; ex-McBain, OLTL; ex-Caleb, PC; ex-Tanner, Days) has written the graphic novel "Credence: Lose This Skin." Check out the trailer here! Sam And Jason Do Damage Control! Even though Jason extracted Kristina from the DOD house before her initiation, Shiloh remains very much a threat - even more of one than Jason and Sam initially realized. Eager to get the goods on the cult leader, Sam pretends to be just as appalled as Shiloh is by Kristina’s “disappearance”. A conversation with Daisy leaves Sam shaken, as she realizes that the loyalty pledge Kristina took may have given Shiloh ammunition to use against her sister. Opposite this, Jason takes the cup Kristina drank from back at the DOD house to GH to be analyzed. He turns to Liz for help. The cup is rushed to the lab - but unfortunately for Jason, Shiloh catches wind of this. Newly convinced that Jason kidnapped Kristina, Shiloh asks Sam to investigate the matter. Jason and Sonny, meanwhile, learn about the loyalty pledge from Michael, who has been filled in by ex-DOD member Willow. Laura asks Kevin to rethink his decision. Chase thinks Michael is hiding something. Anna invites Robert to Kelly’s. Paulina Bugembe is taking over the role of Valerie Spencer. Emme Rylan will be off the canvas for a bit, as Lulu jetted off to Paris last week. Michelle Stafford is leaving as Nina Reeves to reprise her role as Phyllis on Y&R. Cameron gets into a scuffle at school when another student uses a homophobic slur to describe Aiden. After, Franco and Liz have a frank talk with the teen about the possibility that his little brother might one day identify as gay. Cam’s immediate response gets under Franco’s skin. While Liz gives Cameron a piece of her mind, Franco goes to see Nina. Michael puts two and two together on 4/15, while Willow offers her help and Nina confronts Valentin. Michael is sympathetic on 4/16, while Sonny disagrees with Margaux and Chase tests the waters with Finn. Sonny cautions Jason on 4/17, while Alexis learns that Kristina got help from Julian and Carly is moved to tears. Jordan meets with Franco on 4/18, while Ava calls Scott for help and Laura focuses on what is important. Kristina Prepares For Her DOD Initiation! Kristina is on the verge of full indoctrination to Dawn of Day and its elite “circle of trust”, much to her delight - and her loved ones’ dread. Kristina’s initiation ceremony is scheduled to take place at the DOD house and she’s excited. Shiloh’s lieutenant, Harmony, and Daisy help her prepare for the initiation. While Kristina is with the women, Sam sneaks up to the DOD attic, the site of the ceremony, and what she stumbles upon leaves her shaken. So does a conversation she overhears between Harmoy and Shiloh, where it becomes clear to Sam that Kristina handing over a family secret is part of the initiation requirements. Opposite this, Sonny, Jason and Alexis are becoming increasingly desperate to remove Kristina from Shiloh’s clutches before it’s too late. As the ceremony approaches, Harmony kind of breaks it down for Kristina without giving all the details. Shiloh visits Kristina beforehand to give her a pep talk and ceremonial garb to wear, and he leads her upstairs to the attic to await the beginning of the ritual. With their window narrowing, Sonny decides to take drastic action to remove Kristina from DOD’s influence. Alexis is annoyed with Neil. Ava is put off by Curtis’s actions. Laura receives a package in the mail. Ingo Rademacher is returning as Jasper “Jax” Jacks. Finn intends to propose to Anna, but is blocked from getting down on bended knee when Robert arrives to confer with Anna about whether Alex lied to her about which of her memories was implanted into Anna. Anna has a theory and it’s eating her up inside: She thinks Robin may not be her daughter. Anna relays her fear to both Robert and Finn. Ava has a drink with Felicia and Laura. Chet serves it up to Peter. Alexis has a sit-down with Neil. Chase and Willow share a kiss in the classroom. Chase puts Shiloh on notice on 4/8, while Alexis confides in Neil. Jason has to act quickly on 4/9, while Michael is shaken and Neil offers words of caution. Harmony sends a distress call on 4/10, while Alexis is eager to speak to Sonny. Molly confronts Sam on 4/11, while Michael asks Chase for help and Alexis feigns ignorance. Kevin And Laura: Is It Over? With Laura’s faith in Kevin compromised by his decision to keep Ryan’s resurrection a secret, the doctor’s wife struggles with whether or not to end their marriage. Laura takes Kevin’s offer to grant her a quickie divorce under advisement. One of the issues Laura must ponder is the lingering psychological trauma her daughter, Lulu, is experiencing in the wake of her stabbing by Ryan. Laura encounters Alexis, who was representing her in the divorce Ryan sought to hurry through the courts when posing as Kevin and who would file the legitimate divorce papers, if Laura were to give her the go-ahead. Kevin, meanwhile, finds himself in a lonely place for more reasons than just his estrangement from Laura. On 4/2, the show marks its 56th anniversary with a special episode touching on the history of the hospital, and honoring the late Gail Baldwin, whose portrayer, Susan Brown, passed away last year. The premise of the hour involves the final piece of the puzzle of Gail’s will. Per Gail’s wishes, Alexis summons a cross-section of characters to GH. The characters find out why they’ve been gathered together when Alexis reads Gail’s wishes aloud. Alexis finds herself involved as more than just an attorney fulfilling a client’s final wishes: She and Julian cross paths in a significant way. Denise Alexander appears on 4/2 as Lesley Webber, Laura’s mom. Hillary B. Smith returns this week as Nora Buchanan. Matt Cohen is out as Griffin Munro. Dante’s abrupt departure leaves an already-struggling Lulu devastated. Carly and Sonny are rocked by the news that Dante has left town and attempt to console Lulu. Valentin tells a lie on 4/1, while Franco is confrontational and Lucy offers moral support. Scott receives a heartfelt message on 4/2, while Franco is curious and Bobbie and Felicia hug. Sam steals a moment alone with Jason on 4/3, while Kristina crosses the line and Michael needs Sonny. Josslyn calls Carly on 4/4, while Kim receives bad news and Laura is startled. Bradford Anderson (Spinelli) is featured in the Take Five interview this week! Willow To Chase: Shiloh Is My Baby’s Father! Willow is shaken after a surprise visit from the last person she wanted to see: Shiloh, the father of the baby boy she secretly gave up for adoption. When Chase interrupts their encounter, she ends up confessing the truth about her relationship with Shiloh to her new beau. Willow unfurls the sad tale to Chase of how she and her parents came to be part of Dawn of Day, and how Shiloh ultimately seduced her. Chase is alarmed when Willow explains that she intends to flee Port Charles to make sure Shiloh never finds out that she gave birth to his son. Chase implores Willow not to leave town. Though Willow is tempted by his pitch, it’s not enough to change her mind. Alexis fulfills a final wish. Kristina asks Julian for a favor. Laura urges Lulu to leave town. Ashton Arbab is out as Dev, the young man who helped Sonny in Turkey. Noshir Dalal is out as Raj. Dante enjoys a tender reunion with Lulu after returning home from Turkey. Things take a turn for the worse when Olivia throws a surprise party for her son. Shiloh pushes his limits on 3/25, while Alexis places a call to Jordan and Michael expresses his concern. Alexis and Sonny discuss their predicament on 3/26, while Sam chooses sides and Dante is startled. Margaux is giddy on 3/27, while Sonny is discouraged and Liz calls Willow. Valentin pays Lulu a visit on 3/28, while Anna admits the worst is possible and Liz is reassured. Don't forget to sign up for our weekly scoops newsletter for more scoops!! Our other pages for news, scoops, and spoilers: AMC, ATWT, AW, B&B, Days, GH: Night Shift, GL, Loving/The City, OLTL, Passions, PC, Y&R, General Daytime, 24, Battlestar Galactica, Heroes, Jericho, Lost, Smallville, & Star Trek. This page is dedicated to Hilary, our beloved late volunteer, who used to update the scoops pages.